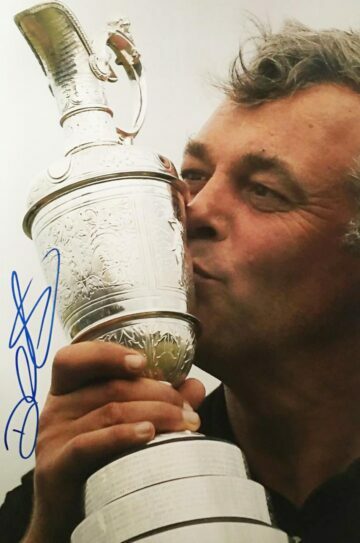 Shop our signed Darren Clarke golf memorabilia with autographed items from the great man. Darren Clarke signed photos, golf clubs, gloves & caps. All with Certificate of Authenticity, fast worldwide shipping and free UK delivery, many with signing proof. Well-known and much-loved throughout the golfing community and the wider world of sport, the legendary Darren Clarke OBE has been a firm fixture within professional golf for over two decades. He was born in Dungannon, County Tyrone in Northern Ireland, moving across to the states to play golf at the Wake Forest University in 1987. Previously he had been a junior member of his local Dungannon Golf Club – which also produced PGA professionals Alistair Cardwell, Barry Hamill and Gary Chambers. After turning professional in 1990 Clarke went on to play his first full season in the European Tour just one year later. 1993 was his breakthrough year – by 1996 he’d won his second European Tour title. He finished strongly with a solid season – ranked 8th in the Order of Merit. Continued success and two WGC wins followed until a rocky period ensued around the time that his first wife Heather sadly died. Despite the devastation, he eventually returned to top form, and still plays golf professionally to this day. In total he has 21 professional wins – including 3 PGA Tour wins, 14 European Tour wins. Clarke also won The Open Championship in 2011. Clarke has represented his home country of Ireland as an amateur and as a professional. He was a prominent member of five European Cup teams between 1997 and 2006. He was appointed his prestigious OBE title in the 2012 New Year honours for services to golf. If you’re looking for signed Darren Clarke golf memorabilia you’ve come to the perfect place. Here at Firma Stella we pride ourselves on carefully sourcing eclectic items autographed by some of the world’s biggest and most successful sports stars. Golf is no exception – here you’ll find signed Darren Clarke golf clubs, photographs and mounted displays dedicated to the golfer’s incredible career.